A super location on the central green of Les Praz, next to the Flegere lift with a view of the church and Mont Blanc. 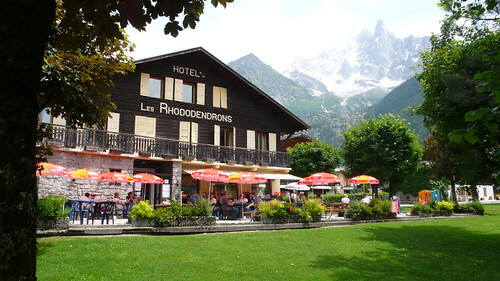 The terrace is a lovely place to watch the sunset on Mont Blanc with a drink. 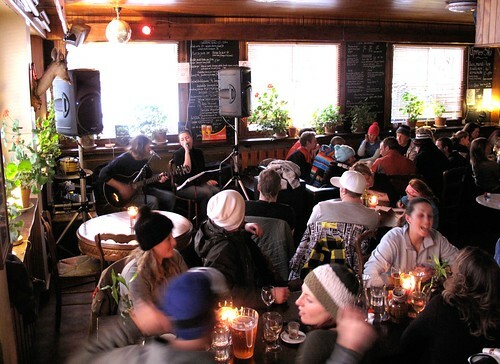 The bar , after its recent refurbishment, is a great place for a drink after coming down from Flegere – it’s friendly and cosy with a log fire and regular live music. Join their Facebook group to keep up to date with events here – bands, barbecues and so on. The house speciality is a fantastic selection of home-made shots – try the figgy vodka or the caramel. Some of the finest Vin Chaud in the valley makes this place perfect! The restaurant, has tasty, inexpensive food in generous plates – exactly what you want after a day on the mountain. It’s especially nice on summer evenings when you can eat outside on the terrace lit with torches. Ideal for families in summer, as there’s a play area for children, and plenty of room for them to run about on the green.